It was Dina Peterson's birthday. She invited friends via Facebook for an Ethos dinner and conversation celebration. I arrived early straight from work and started blocking in this sketch figuring she would push some tables together to eat with friends in the main dining area. I was wrong. I was halfway into the sketch when Dina arrived and told me she would be sitting outside. 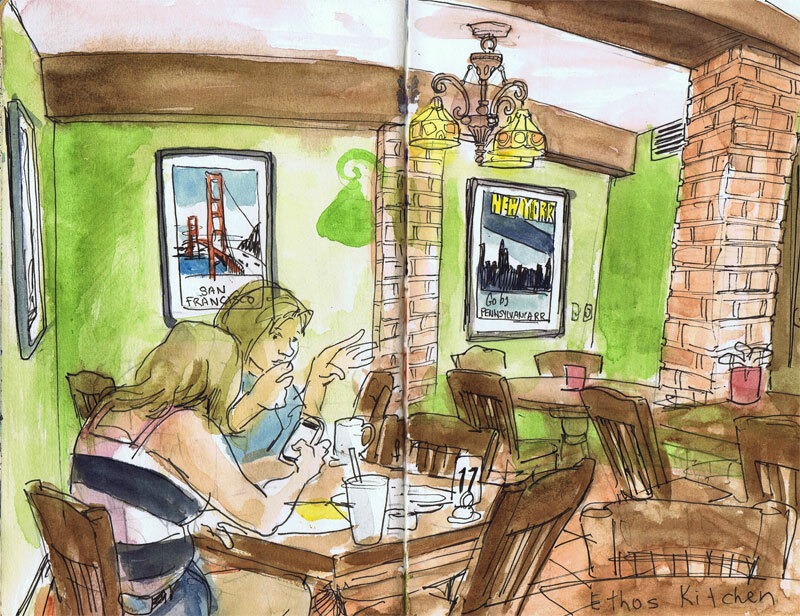 I never abandon a sketch but the dining room was absolutely deserted. My heart sank. Thankfully a mother and daughter sat at the table in front of me. Outside several tables were pushed together and Dina's friends began to arrive. Maria, Tia and Sophia were at the far end of the table. Denna Beena was there with her fiance Travis Fillman. It was a creative, holistic, fun group. Travis had a brand new 3-D smart phone. He took a photo of Denna as she held her hand out menacingly towards the camera. The 3-D image was impressive. A train whistle blew in the distance and Travis ran to the train tracks to shoot a 3-D video clip. Amanda Chadwick read excerpts from a diary she kept from elementary school days. The entries were blunt and hilarious. Terry arrived late and when she arrived we split a plate of vegan tacos. Terry gave Dina a birthday card with a painting by John Sloan. The painting depicted a social gathering much like this birthday celebration except the intellectuals in the painting wore turn of the century outfits. I realized that the artist must have been seated at a table away from the main gathering. I looked around and saw a table with a good vantage point but decided to relax and enjoy the conversations instead.